Allen Martin Drive serves as the primary access point to the Saxon Hill Industrial Park (SHIP) in Essex. Continued development in the park has led to a concern of traffic congestion and left turn conflicts at the Allen Martin Drive and VT 15 Intersection. Ultimate SHIP plans include a secondary access road to River Road / VT-117, but until this road is constructed, Allen Martin Drive is expected to remain the primary vehicle access route to the SHIP. The Town of Essex has sought assistance from the CCRPC to complete a scoping process that will evaluate existing conditions including intersection sight distance, truck turning movement and signal warrants and assist the Town in selecting a “preferred alternative”. The primary geographic scope of the study area is limited to the VT-15 / Allen Martin Drive intersection. 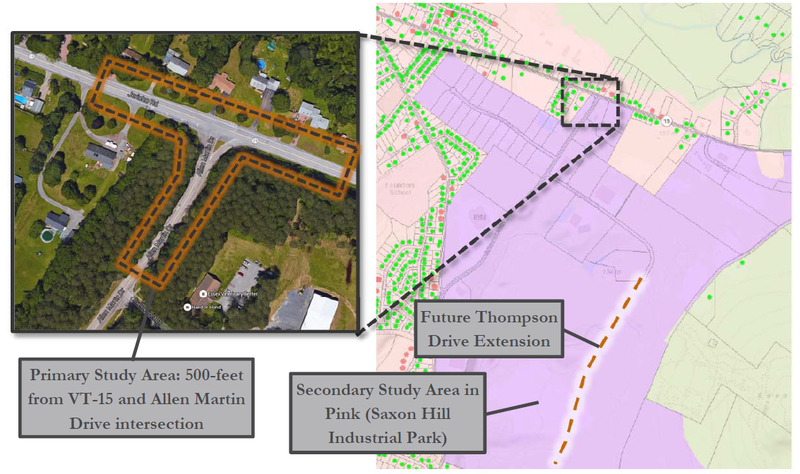 However, based on the outcome of the future traffic conditions assessment and discussion with the Town, the Thompson Drive extension may be added to the study area. For more information, contact Sai Sarepalli, CCRPC Transportation Planning Engineer, at (802) 846-4490 x *16.